The previous post was about options to use ontologies and semantic web technologies for indigenous knowledge management system/digital preservation of cultural heritage/traditional knowledge systems. There is already some data available for such systems, but still a lot is to be collected, digitized, structured, and so on. Here’s my very modest attempt of “going with my hands in the mud” on the digitization part, both because it’s long overdue and so as to get a first-hand idea what data collectors may face, of which one thing was that, despite searching online quite a bit, there was remarkably little available, and even that was hard to find. The two cassettes include folkdance music from—using the originally mentioned countries/regions—Bulgaria, Catalonia, Czechoslovakia, Denmark, England, Greece, Hungary, Israel, Mexico, Netherlands, Portugal, Romania, Spain, Turkey, USA, Wales, and Yugoslavia, which, in other years, included dances from other countries, such as Poland and Russia, as well. To give a random example of the music of a dance from each of these countries/regions: Bulgaria with Kopanitsa, Catalonia with ball de pastors del pirineo, Czechoslovakia with ceresnicka, Denmark with gamble gammel nr 12, England with St. Nick’s Jack, Greece with choros mais, Hungary with fercelö, Israel with mocher prachim, Mexico with la capsula, Netherlands with bravade, Portugal with malhao malhao, Romania with hora femeilor, Spain with el candil, Turkey with kendime, USA with steppin out, Wales with a name unknown, and Yugoslavia Macedonia with kales more dimco, and one of the Russian dances was the troika (which I have only as sheet music). The only ones of which I have not deciphered their origin yet are the vlaski tanz (my guess: one of the new countries from former Yugoslavia) and one with the quasi-readable handwritten name halleluja lufall (or similar), and there are four dances without a name (two from Wales, and two from Portugal). update: Marija Slavkovik, from Macedonia and with whom I shared an office for some time when studying at FUB, refined the “Yugoslavian” ones as follows: the poskos and çaçak are Serbian, kales more dimco is Macedonian, and the Vlaski tanz Serbian, Macedonian or Bulgarian. 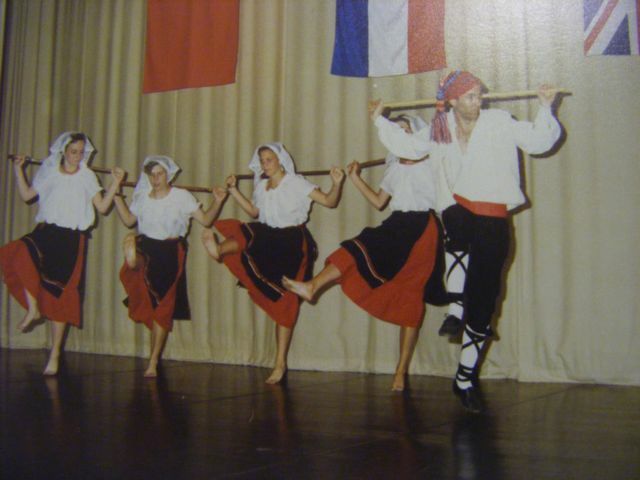 As an aside, the first folk dance I learned when I was 6 years old was the mayim, and the first one I participated in with a demonstration was the French dance the ‘river the Rhone’ (I’ve only sheet music of them, which I may scan and/or play on the recorder flute another time). The dances in the directory on my home page are still in the sequence as they were on the tape instead of neatly annotated and sorted by country, genre and so on. Besides, I’m neither a musicologist nor a folk dance expert: aside from the country/region inserted in the mp4’s file name, I can go as far as the basics, like ‘fast’ or ‘slow’ or both (e.g., virgin blanca, Spain), and annotating a song ‘with singing’ (e.g., kendime, Turkey) or ‘instrumental’ (e.g., the kukunesko choro, Bulgaria), or, zooming in on the actual dances, ‘this has some mayim/polka/…-steps’ or ‘arm-waiving’ (e.g., eretz eretz, Israel, malhao malhao, Portugal) in the dance, and a basic configuration of line or string (iirc, the poskos series, Yugoslavia Serbia), circle (many, e.g., rusi kosi, Bulgaria) or square (e.g., St. Nick’s Jack, England), and/or pair dancing, or both square + pair (e.g., bravade, Netherlands), or circle + arm-waiving + moving from circle-to-centre-and-back (nad-ilan, Israel), and so on. One or more ontologies, or at least some basic structured controlled vocabulary, to annotate this could come in useful here, with knowledge represented about choreography, types of steps, dance styles, and so on. The usefulness of that? Among others, subsequent querying of the music files once there are many (e.g., “list the square-dances from country x”, “what are the first 10 opening steps dance y?”), help categorizing dances for which only partial information is available, easily compare dance styles across cultures, mutual influences, analyse the rhythms, variety in steps, difficulty of the dance, etc. This is indeed in full costume, which was, at least when I was in the adult dance groups, always the case when we did dance demonstrations. (Not that I was really an adult at that time—basically, in secondary school—but the only ones left in our age group were Lilian and me; we were too old and experienced for the kids, so the members in the adult group decided they were willing to tolerate us in their group.) One could participate in demonstrations at least once a year, for those who were interested in it, and most notably during the Brabanste Dag when the village turns medieval for a week. The costume in the photo below is one for a set of Jewish dances we performed during one of Brabanste Dag festivals (going by my haircut, I guess it was in August 1988, and the photo certainly was taken in the garden of the building where we danced weekly). Most of the costumes were hand-made by the female dance groups members, and while they look nice indeed, I still would say that their sewing and needlework expertise showed itself off most with the Dutch costumes. 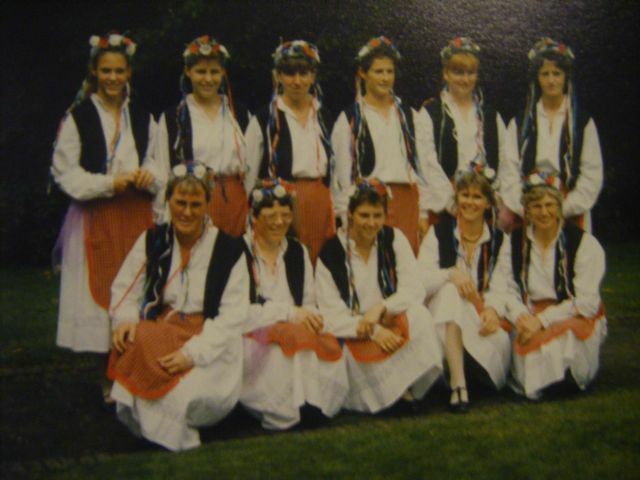 One of the more recent dance instructors of Maroesjka has some ‘old’ (1989) pictures on her website with Maroesjka members and traditional clothes from different Dutch regions and cities (and more pictures). 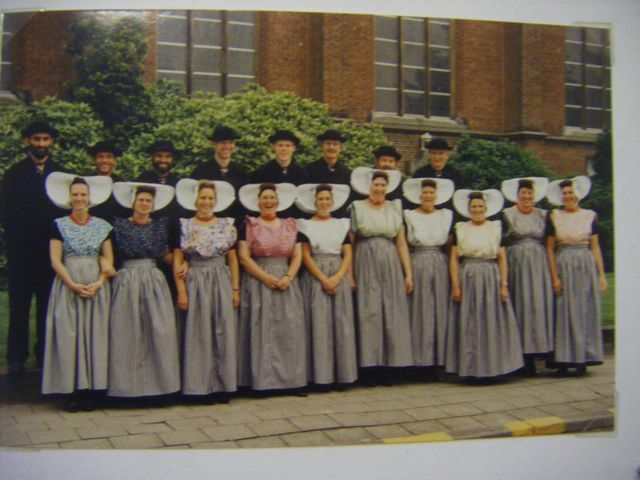 To feed the stereotype, here’s a group photo of our Dutch dances demonstration group when we participated in an international folk dance festival in Antwerp (in 1991? ); I’m third from left, with my real hair. Group photo of the Dutch demonstration group of Maroesjka, during the international dance festival in Antwerp in about 1991. The clothes may look a bit dull, but it takes about 1.5-2 hours to dress, one needs help with sticking in the pins, and it is hot in there. What seems like a blue striped skirt is actually just an apron. Underneath is a long black, thick, skirt, and underneath that an under-skirt. The colourful top is stiffened and held together with all those pins in different places. Then there’s that cap on our heads, which requires you to muffle away long hair, roll up the ‘fringe’ evenly, and then fasten the cap with as many hairpins as needed to make it unmovable. The men were ready in less than 10 minutes (trousers, blouse, hat). We skipped the clogs because it is too heavy to dance with, except for one short dance that only the men did during the demonstrations. 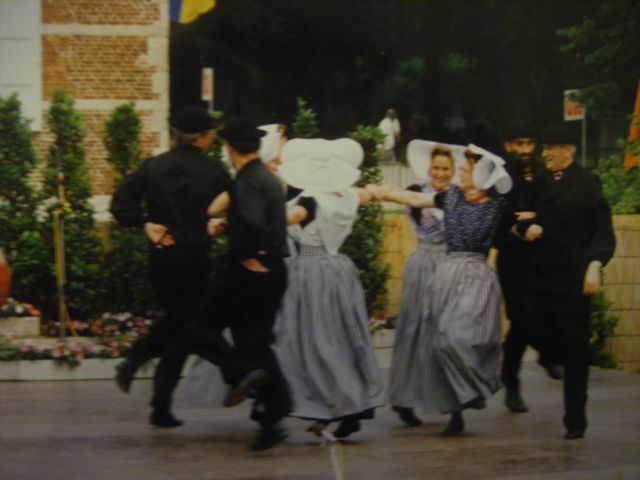 Our Dutch folkdance repertoire included, among others, the bravade, mazurka, hakke toone, and the vleegerd. (I only have sheet music for the latter two, and may record it some time later, since I haven’t played the recorder [flute] since a while and was never good at it anyway—btw, there is also a Dutch song database with sheet music). I can’t remember the name of the dance we were dancing in the photo below, but the figure we’re making is that of a windmill, with each couple representing a sail of the windmill that is held together firmly at the centre (hand-to-wrist cf. just holding hands), so that some real dancing speed could be achieved whilst going round. A few Maroesjka members went on to set up the Platform Nederlandse Floklore, but also that site does not have much information, and is structured about as good or as bad as this post. They have posted a few videos of Dutch folkdances on youtube. Finally, I am aware the above information is not really readily available in an easy computer-processable format from a knowledge management viewpoint. Nevertheless, perhaps it was an interesting read. Overall, it already took a lot more time to digitise and ‘annotate’ it (well, write this blog post) than I thought it would take even for those two cassettes: one evening digitizing, 1-2 hours online search trying to find related relevant material, two evenings writing this post, and another hour to upload and layout it all. To collect and computerize all of South Africa’s indigenous knowledge in the “national recordal system” NIKMAS (driven by the NIKSO office) surely is going to take a very long time by very many people.